The past few days have been a bit of a mixed bag for us. Our progress has been slow as we continue to get hit by challenging winds. We’ve been doing our best to steal some mileage in between the patches of stiff headwinds but overall it feels like we’re currently spending more time sitting around than we are rowing which is frustrating. Our freeze-dried meals are stored in a few of our deck hatches so when you reach in to grab one, it’s essentially a lucky dip to see what you get for your meal. We knew we had some freeze dried egg mix in one of the hatches but up to now, we hadn’t yet found one. To make up scrambled eggs, you just add water to the mix, stir it up well and then cook it over a flame (just like you would do scrambled eggs at home). Well earlier this week we pulled out two of these beauties so our breakfast on Wednesday morning was scrambled eggs and a sausage which was a real treat for us. We have one bag of sausages so these are somewhat of a delicacy for us when we have them. Our breakfast is usually a bowl of porridge washed down with a coffee so the eggs and sausage was a very fancy change for us. We also have 1 power bar each per day but our supply will run out before Cambridge Bay. So when we got to Paulatuk a few weeks ago, we added in a few boxes of pop tarts to supplement the power bars. I’ve never really eaten pop tarts before but they’re actually delicious and go great with a cup of tea (what doesn’t). So since Paulatuk, we can have either a power bar or a pop tart each day. As with all our meals, we’ve been fairly rigid with sticking to our daily rashions so we were quite surprised to learn last week that our pop tarts were finished. We searched the boat but in vain and the mystery of the disappearing tarts shrouded the boat for a few days as we all knew that nobody was eating extra ones on the side. Yesterday morning, Denis found the remaining stash of pop tarts; this felt like we had all just received an extra Christmas present!! The last 24 hours have been frustrating. We pulled out of our last shelter point in the early hours of Friday morning but we had a very strong current against us which slowed us to a near standstill. When you row The Arctic Joule into a strong current, it feels like somebody is pulling the boat in the opposite direction and so every stroke requires huge effort and feels like your pulling the entire dead weight of boat. which makes for very hard rowing at very low speeds. As we were making virtually no progress, we dropped the anchor after a few hours to wait and see if the current and wind would ease to a point where we could actually make some progress again. Just before we got going again, Denis spotted our first Grizzly Bear. 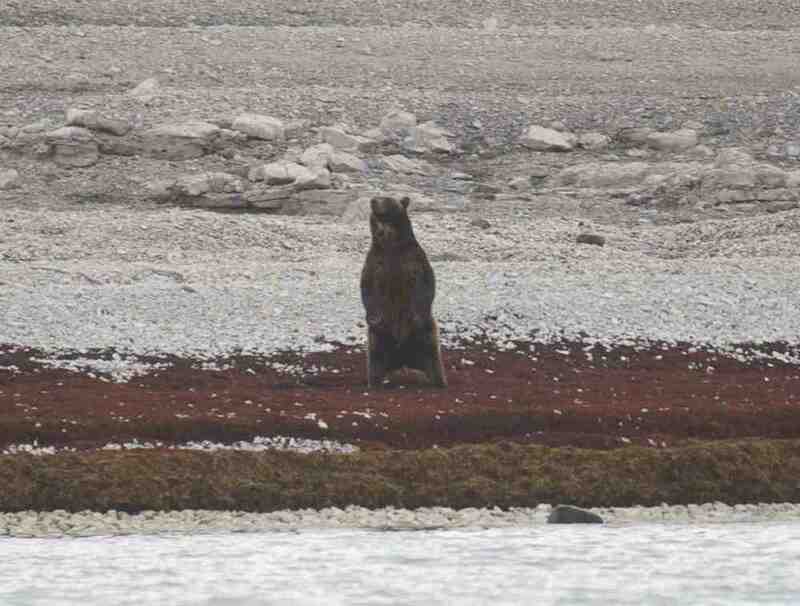 We were anchored about 150 – 200 metres off shore and the bear was right beside the waters edge. It was very exciting to see such a powerful creature like this in its natural wild environment. At first it was just lying amongst the sea weed by the shore line, then it raised itself up on its hind legs and focused its attention towards us sticking its nose in the air to smell our presence. This is day 43 of our trip so I’m sure whatever scent the bear picked up probably wasn’t all that pleasant. Frank went into the water to get some footage for the documentary. 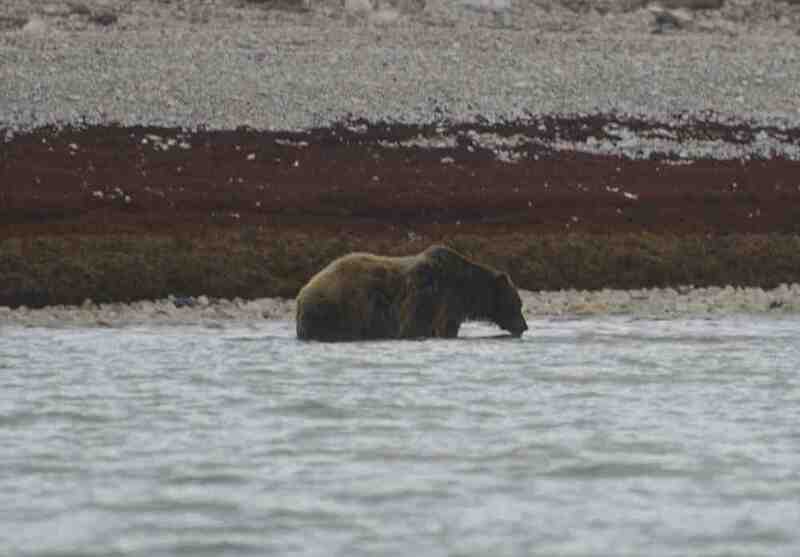 The Grizzly did start moving into the water towards Frank but there was plenty of distance between them and the bear didn’t really move much further before returning to the shore. This was a quite a large Grizzly and as far as we could tell looked well fed and healthy. We spent about 40 minutes in the company of this magnificent animal before deciding to push on. The bear shuffled off quite quickly when he heard the clunking sound of our anchor as we pulled it in on deck. After we got going again, the first hour was a slog but the current gradually eased and we are currently making good progress. We have some mixed winds forecasted for the next 24 to 48 hours so we’ll just keep plodding along as best we can. In the last few minutes, we have just rounded Cape Bexley which means we are now pushing south east towards Cambridge Bay. We still have another 450km or so to go before we reach Cambridge Bay but rounding this Cape is another milestone for us along the way and the bear sighting has definitely lifted everyones spirits……..
Our previous evening’s storm blows itself out by the middle of the next afternoon and we start moving again. The weather report is grim but our hope is to poke along like yesterday and steal another few kilometres when the wind takes a breath. We make the first of two moderately large crossings in chunky water with light winds and are happy with the effort. But the sea has begun to build and we slip into a well protected bay for dinner and some sleep. It’s 12:30am, we’ve eaten and we’re readying for bed. Night is much more pronounced now with the ten minutes of reduced light dropping off each successive day making itself felt. In just over a month darkness will match lightness on a regular day. 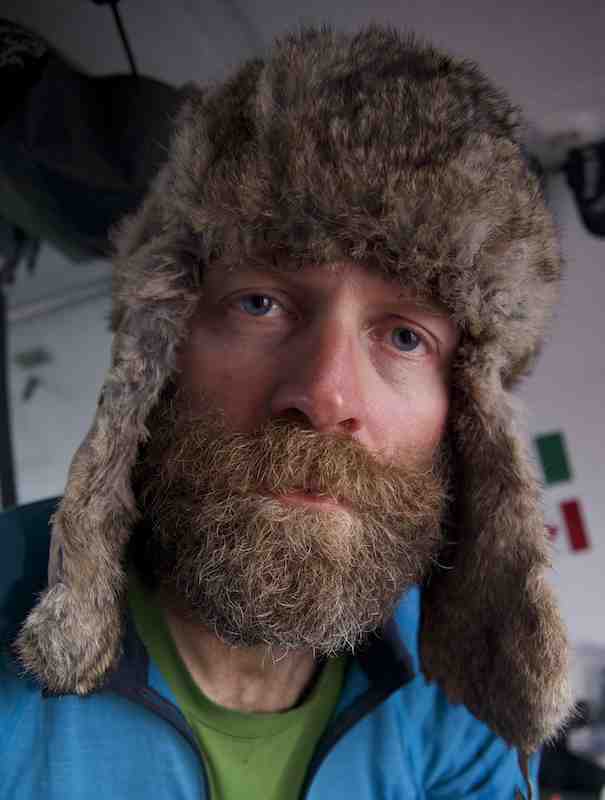 Paul is last into the cabin and observes that the wind has died. Windless conditions, no matter when they occur, mean movement for us. This is one of those moments where I find myself digging deep. It’s dark and raining out and I’m in my sleeping bag ready for sleep. “Pop in a quick three hour sesh?” Frank asks with the enthusiasm that I feel. “Sounds good” I lie, and we start packing up. We slip out of our bay, a bruise of broiling clouds pushing across the horizon. A misty drizzle blankets us as I slip my iPod on under my hood. Pink Floyd, I float through the twilight. 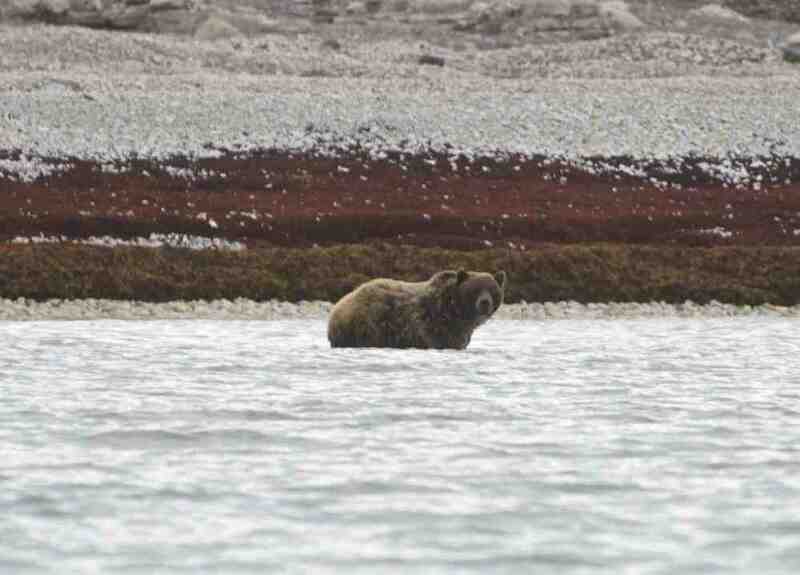 Lying in the kelp at the edge of shore is a large brown bear. He’s completely oblivious to us and he’s a giant. His massive shoulders support a huge dish faced head, his distinctive hump make him unmistakable: grizzly bear. Frank quietly slips out of the boat to get a steady shot with the video camera – the boat is rocking and the water is only a couple feet deep even out this far – and we’re noticed. The bear immediately stands up on his hind legs and starts vigorously shaking his head back and forth to pick up our scent. He’s aware of us now and he’s not afraid. Far from it. Our mighty bruin starts to move towards us in the water. His body language speaks to us on a primordial level. His head is low and the hair on his back seems to be standing erect. He moves with slow deliberateness, eyes locked on us. The body language says it all. On some primitive level we all fear being hunted and this bear has peaked this vestigial urge. Denis grabs the shotgun and readies a shot in the air. But our bear is just letting us know who’s boss. After a few minutes he turns and slowly heads back to the kelp bed he came from. He sets about making a bed and lays down to rest. When he finally lowers his head, he turns it away from us, disinterested and unafraid. It’s a humbling moment, one we’ve been waiting for all trip. 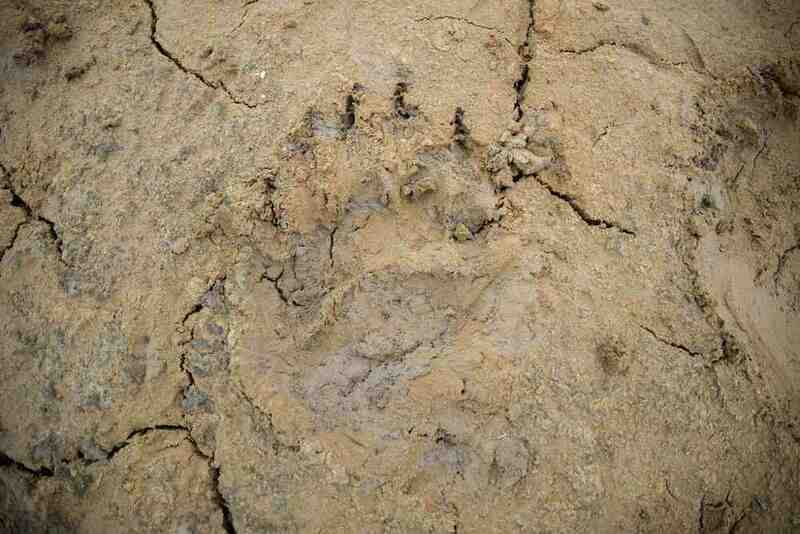 The prints aren’t huge, likely double the size of man’s hand, but the profile is unmistakable: grizzly bear. They seem very fresh, likely minutes old, prints of a bear in flight (we surmise) having seen a strange object approach through the fog. We stole 28kms today. The weather forecast had been for high winds and difficult travel but our morning builds to a guarded calm and we jump at it – calm water in the arctic is as rare as winter sun in Vancouver after all. Remnants of DEW Line Site PIN-2 has been staring at us from our evening’s moorage and we elect to pop in and take a look. I find these decommissioned sites far more desolate and lonely than the surrounding landscape purely because of the echo of a past human presence. Poking around them is always fascinating. 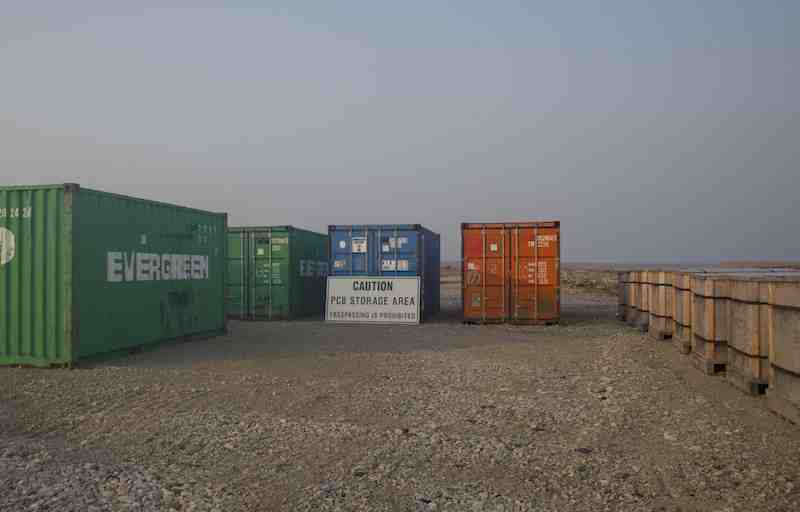 Once on shore we make a short walk uphill and are presented with a grid of large metal shipping containers neatly placed in row and column, as cold and ordered as an accountants ledger. Adjacent is a smaller grid of large plywood boxes on palettes. A large sign boldly states: “CAUTION PCB STORAGE AREA TRESPASSING IS PROHIBITED” An unhappy legacy to time past. A gravel runway sweeps across the site, compact and useable. 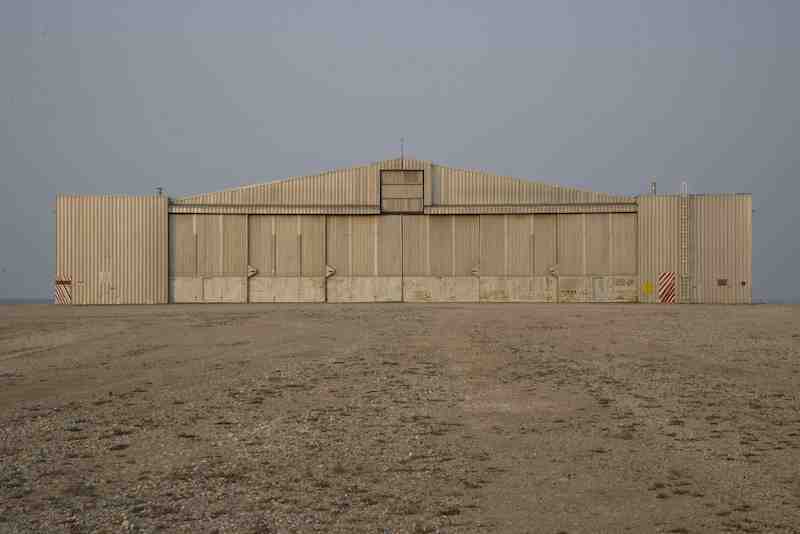 A large metal clad airplane hanger lords over, its shape strangely pleasing in an architectural sense, its proportion and form reminiscent of a post-modern expression. It’s all so strange in such a landscape. A medium Northwester builds to push us to our next point of protection. Patrick, a retired meteorologist who is kindly helping us with our forecasts, suggests the winds will intensify soon. We find protection and the winds do as he says, to near gale force. It’s nice having a guardian angel or two. 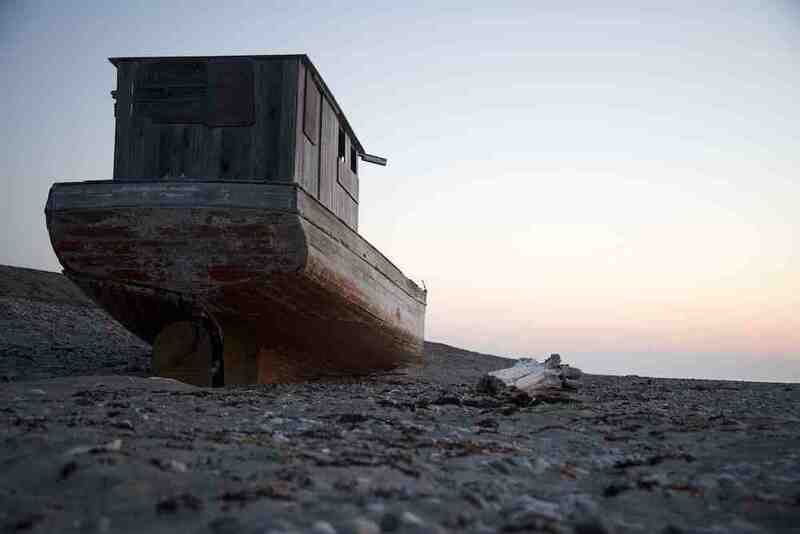 We’re able to get to shore in this lee and elect to sleep in the tent for the night. (tent poles are fixed from the last wind storm) The ground in the area is low-lying with grassland, tidal flats and gravel bars wrestling for dry their share of the dry ground. Looking for a good tent spot has us searching the area and this is when we see the tracks. A grizzly bear print stands out like no other with divots from the large claws radiating out from the body of the print. When seen side by side, the front paw prints turn in towards one another indicating a slightly pigeon-toed stance. These tracks look like they’ve dug into the mud in an explosive gallop. Did this animal scurry off in a hurry? Was it us it was running from? Frank’s Grizzly Beard – without a doubt top of the beard food chain, this beast takes on a life of it’s own at times. I think it actually did some rowing yesterday while Frank was resting. If you look at Frank’s face for a few minutes you can actually see it growing. An absolute monster of a beard !! Kevin’s Polar Beard – a healthy beard no doubt but one that contains a strange mix of red and white, mostly the latter. Definitely a candidate for Santa Claus in the near future, Kevin’s beard needs very close monitoring as it is aging rapidly. There’s a chance by the time we get to Cambridge Bay, the red in the beard could be completely gone. Denis’s foxy beard – this is definitely the one beard that provoked the most discussion amongst us. This is an out and out “ginger beard” but the tash part is a peculiar blonde colour which makes it harder to see. All of this is in striking contrast to Denis’s dark black hair on his head so there’s definitely some freakiness going on here. Here are some photos of these beauties!! On my last shift, I was listening to some Dylan and had a quiet chuckle to myself when “Blowin’ in the wind” came on as this pretty much sums up our movement. We’ve had a few great days with calm seas and glorious sunshine so we’ve made good progress (about 130km over the past 48 hours). Some stiff south easterly head winds decided to come visit us so we spent most of yesterday on anchor in a small bay. It’s mad (or maybe not so mad at this stage) how comfortable you get with the confined cabin space and sharing it with 3 other lads. We had a good feed last night, a mug of scald (tea) and a few games of cards before hitting the hay around midnight. When all four of us are sleeping in the cabin together, we aren’t quite on top of each other but there is virtually no room between us so we essentially sleep shoulder to shoulder in the cabin. As odd or uncomfortable as that might sound, it’s actually not too bad – it’s amazing how easy it is to sleep when you are really exhausted. Although waking up inches from Denis’s mug on one side and Frank’s on the other isn’t exactly how I would look to normally start my day. The forecast wasn’t great for the next 24 hours but around 3am, the wind died off a bit so we got back on the oars and have been going for the past 6 hours or so. The sun has left us and the fog is back so visibility isn’t great but at least for now we’re moving forward….. 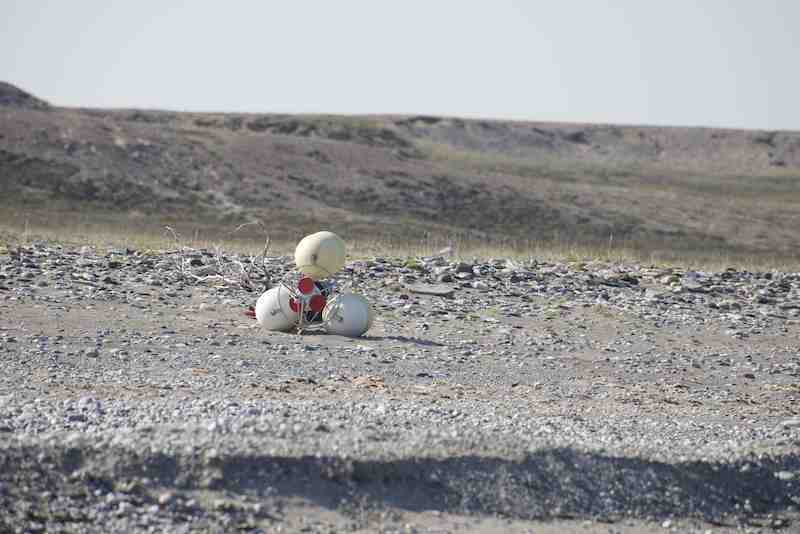 The beaches of the Northwest Passage eventually catch the detritus of the arctic waters and leave it on display for all to see. Rusty oil cans rank as the hands down leader in arctic rubbish, their matt reddish tinge regularly catching our eye against the steely grey background of rock and stone. The shear number of used drums speaks to the difficulty of motorized travel in the region as does their abandonment to a certain indifference to the landscape. Driftwood abounds on the beaches, the massive outflow of the Mackenzie River still being felt as far afield as the Dolphin and Union Strait where we are. There is no lack of firewood when we need it. Styrofoam is an ordinary observance here as well, its properties resisting decomposition like few others. We stumble upon a strange device the other day that appears like something from outer space. 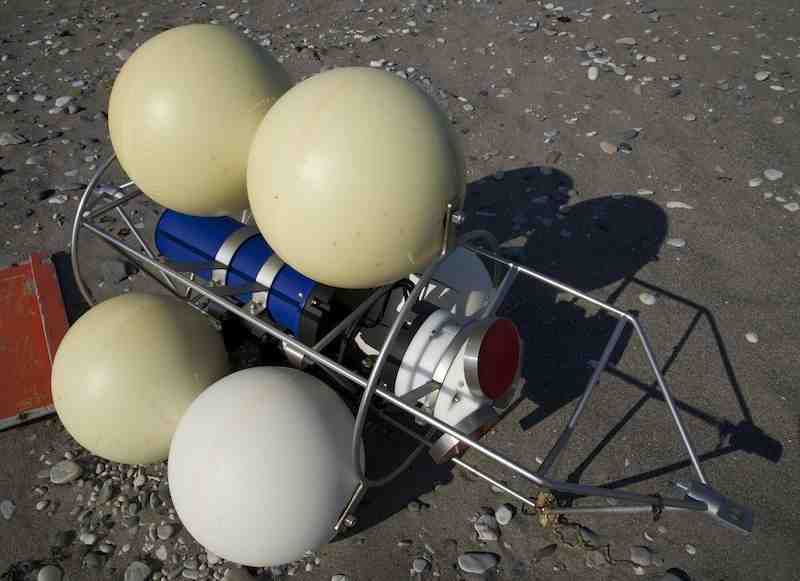 A stainless steel cage is encircled by six plastic floatation balloons and houses a long blue and white instrument with three orange faced saucers at its end. I’ve never seen anything like it before. We mark the point with our GPS and take down a company identification email to let them know where the device lies. 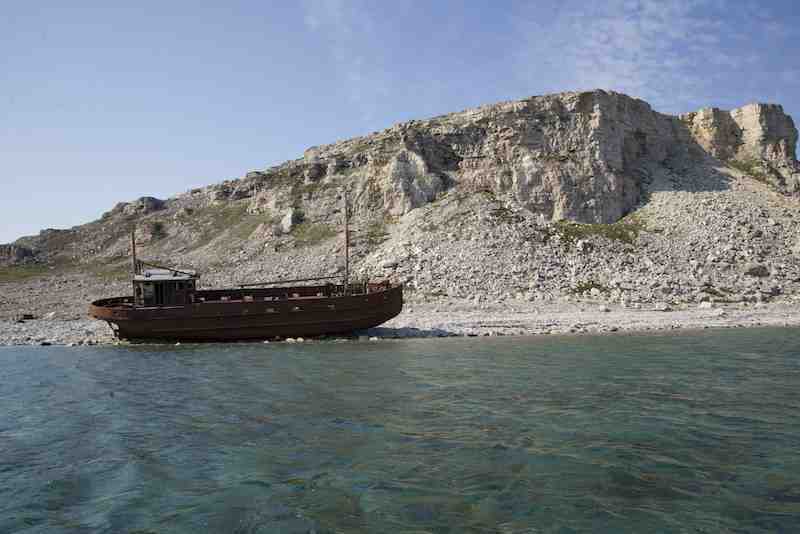 The rock strewn ramparts of the Northwest Passage talk to a a more demanding history as well. In the course of one 24-hour rowing session we sight two shipwrecks, boats of an indeterminate age stranded high on shore, their final act on display, their history unknown. The last two days have been tremendous for us with the wind dying and our rowing efforts continuous. But good things always come to an end and southerlies have returned with a vengeance. 25-30KN winds are forecast for the next couple days and thanks to sage advice from our meteorological eyes-in-the-sky we’re hunkered down in a relatively protected bay at Cape Young. We travelled over 120kms in the last 48-hours so our spirits are high as we head into our forced layover.